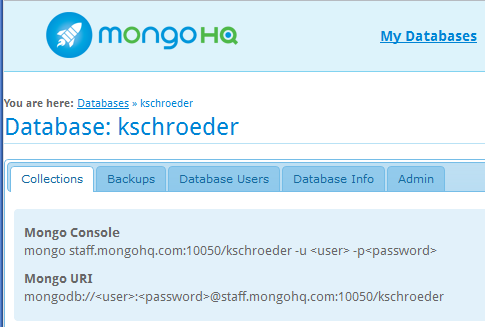 With the release that occurred on March 4th we have added Mongo support to the DevCloud. So connecting to a Mongo instance is extremely easy to do now. We don’t provide access to a Mongo collection but you do have the tools to connect to various Mongo service providers. For this example I used MongoHQ though any service running Mongo sound work. Now you’re doing Mongo on the DevCloud like a boss. It took me all of 10 minutes to do this. This seems to be pretty easy..
@SamuelCarlier For development purposes it would be fine unless you’re dealing with huge amounts of data. My own testing has shown that while there is additional latency, it’s not actually too bad.